BIG words for 2007: 1st word CHOICE!! The effect of choice…this will be bigger than it already is. The information overload..The abundance.. The customization. I already talked about Barry Schwartz idea of the negative aspects of choice. How will me manage it all? What effect has it on us that we know that we cannot oversee the total supply of things we can attain? What effect does it have on brands? To cope with the abundance of supply will we sell ourselves the story that it is not the “buying of the best” that counts but “enjoying what you have bought” that counts. Whatever the choice was. Will we learn to see value in everything to cope with this constant cognitive dissonance. So are the small things the new treasures. The small brands, the crafters and the passionate. I believe so.. We will be more inclined to shop favourable “companies” than to rationalised comparisons. Is this the reason why Stormhoek sells so much wine? So are you maximizing or satisficing? Looking for the ultimate camera, wine, tv programme, blog, teapot or dress. Or do you handle your choices differently? First suitable offer presented you “buy”? Maximizers die early and are unhappy. Just been tagged by Yme. So you probably know the drill.. Time to share 5 things with you you don’t know yet. 2. I always wanted to be an architect( I love LEGO ;-)). Somehow I still see myself as an architect. I am just not working on buildings..
3. I rediscoverd the web only this summer. Last 6 years been so focussed on mobile that I didn’t (really) see the change. Trying to catch up..
4. I hate it that I cannot program. So many great ideas so little skills..
5. Next year around X-mas I will be doing something completly different than what I am doing currently.. I posted this directly from the site to this blog with the new Fleck feature. This makes posting a lot easier! Fleck.com Blog » Fleck Straight To Your Blog With Fleck! Finally the distribution of the barcodereaders is starting. 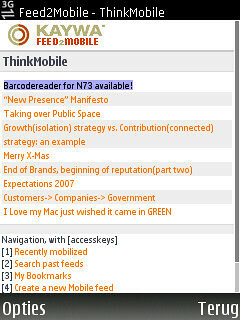 In the download section of the N73(if you update the catalog) the barcodereader is available.. Let the games begin! Just try to scan the QR code on my about page. It will lead you to my Feed2Mobile page from Kaywa. I see more and more examples of people leaving their mark(Tag) in public spaces through stickers. Next to that pins seem to be very hot too. The stickers and pins I am talking about are not of big brands but small initiatives/personal notes and blog promoters. Now that we are all taking over internet. The last regulated domain are the streets we live in. Mass media still regulate the streets. Big campaigns, billboards and posters. So how can we express ourselves and show our creativity in public space? How can we leave comments? How can we share our mood today? Wouldn’t it be great that we would own and use public space to leave our messages. The lack of abundance(and the zero cost mechanism) in meatspace prevents this. The only way is the virtual way. Connect every object and position to the internet..
Found a nice clip on YouTube how a contribution strategy(see posts below about end of brands) works in a connected community environment. This example is in meatspace, but is just valid as online. The last decades companies have lived in isolation. They were to big and technology was not ready to create dialogue with your favourite people(customers). Many research firms helped companies to interpret the needs of their customers. Ad agencies tried to help you reach these customers(brands, mass marketing). As a company you defined yourself through the difference between input(ingredients) and output(product, brand). Those were the only real tangible elements of the company. These elements defined WHAT kind of machine you are: I make phones, I sell coffee, I advice. The goal of these companies was to grow. A very logical goal for an isolated company(come back on this later). As you feel part of a bigger tangible network your focus of WHAT changes to WHY. This is the same for customers asfor companies. Next to individual growth a new need is being developed: the need to contribute. When you are in a network growth is less important than contribution. Think about sport: which question is a soccer player concerned with? How can I contribute to the team or how can I become faster/stronger(input-output). In individual sports people are focusing on input/output. We feel responsible for the group. This is in human nature. The networked internet provides the fundament for the development of contribution. It is the fact that we are connected that we are able to start contributing. Our identity will be a less important item to focus on. Our role in the bigger picture will become the major question. It is the “why” question that will be big. Brands have always focussed on the “who” question.. I believe tha this change has the following consequences for companies. It is the customer who will ask you(Mr. company): “how you will contribute to a better life and a better planet?” Fulfilling his/her need by doing so and pushing you to do some hard thinking. As a company you will have to ask yourself what you contribute in this network of People, Companies and NGO’s. Do not focus on input and output only. Ask how you can contribute to a better place. Customers will drop brands like hot potatoes. They are not loyal to you as you have not been loyal to them. Another consequence is the irrelevance of lifestyle marketing(see part one). Products will not be used to buy identities(excluding teenagers?). Just as companies, consumers are less focussing who they are. Collaboration and contribution will be the key words in this networked life(style). So forget about these aspiring lifestyles. Some industries which will be hugely impacted through this new thinking are: automotive, cosmetics, fashion and gadgets. Typical products based on aspiration marketing: Selling you the lifestyle. Here is my prediction: we will ask the brands in these sectors to tell us how their products contribute to a better planet. “So Mr. Tommy Hilfiger how does your lifestyle help us?” “So Mercedes how do these cars help us?” Shouldn’t these brands be focussed on facilitating us? Facilitating(contributing) the lives we want, and do this in dialogue. For clothing for example what is important is that you as a company do everything to let me feel the way i want to feel. Next to that the product needs to contribute(not talking about RED initiative, good start). I am talking about good materials, good design, economic, clean and green. Now this doesn’t look revolutionary does it? Well it is.. Because companies don’t sell brands(symbols of aspirational lifestyles) but are facilitating me in my life. Next to that the company will be judged by it’s reputation and not it’s created image(by marketing). Transparancy is the key attribute to make this succsful transition.